Scott A, Bressler N, Ffolkes S, et al. 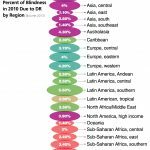 “Quality of life” ranked as top concern by non-Hispanic Whites (73%), and Asians (68%)–when asked to consider various possible consequences of vision loss. African Americans (66%) and Hispanics (63%) ranked “loss of independence” as their number one concern.